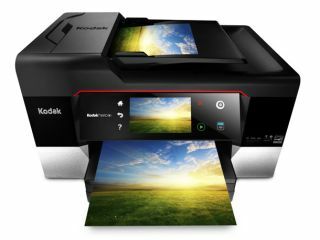 Struggling camera and printing brand Kodak has denied that it is filing for bankrupty amid increasing rumours over its future. The rumours started after the company hired Jones Day, a law firm well known for handling bankruptcy protection cases. Talking to the BBC however, Kodak Eastman, said it was "not unusual for a company in transformation to explore all options." Last week stock began to plummet after Kodak revealed that it had planned to borrow £103m for "general corporate purposes." On Friday, shares had fallen by 54%. Stock has been steadily falling this year, with each share valued at just £1.20 last Monday, compared with £57 in 1997. Kodak has not made a profit since 2007 and is now continuing to explore the sale of its digital imaging patents, which are worth an estimated $2billion. An analyst working for Raffety Capital Markets told the BBC "I don't believe bankruptcy is inevitable, the portfolio should get a good price." Kodak currently has a market value of $210m. In February 1997 it was worth $31billion. In an attempt to keep up with current trends, Kodak has expanded its printing market. Last month Kodak launched its latest line of printers, the Hero range, which uses its own proprietary pigment based inks and can print from anywhere in the world using Google Cloud. Kodak currently produces sensors for other photography brands, including Leica.